Get Out can’t get out of its own way, stumbling from outstanding in-group out-group frights to Phantasm body-snatcher silliness. With an opener depicting upper-crust suburbia as terrifyingly as the original Halloween, a random African American man is suddenly murdered walking through a gated community. The tension is agonizing, compounded by teeth-chattering musical accompaniment. Shifting gears to its whiz-bang Guess Who’s Coming to Dinner premise, Get Out reminds us that there’s lots of interesting territory to be mined here, and for the first third of the run-time, it is. African American Chris (Daniel Kalyuua), and Caucasian girlfriend, Rose (Allison Williams), are off to meet her parents in a secluded house in the woods. 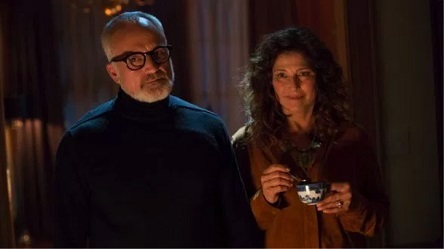 Pops (Bradley Whitford) is a Dennis Hopper-ish glad-hander, who, along with wife Missy (Catherine Keener) are eager to show off their liberal bona fides. They’re both healthcare professionals, she’s a hynotherapist, and convinces Chris to try a smoking cessation session. In the film’s second high water mark, she probes Chris’ subconscious by having him recall childhood trauma, sending him into an abyss. There’s some wicked simmering racial tension between between Chris and Rose’s slightly-built brother Jeremy (Caleb Landry Jones), who drunkenly boasts of the strength and power-negating properties of cerebral jiu-jitsu. It’s riveting stuff, heightening Chris’ self-doubt about the family’s true intentions, heretofore half-concealed by dad’s “I would’ve voted for Obama for a third-term,” sycophancy and his girlfriend’s steadfast reassurance that they’re all good people. 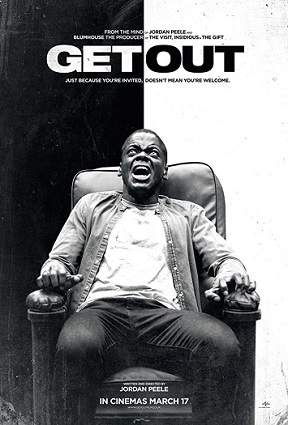 The rest of Get Out is, however, as un-subtle as Night of the Living Dead was subtle (hell, even the poster is black and white with a line of demarcation down the centre). The family hosts a big party, and spate of new characters appear, diluting the twin-scares of woodsy isolation, doubly felt by a black protagonist who’s isolated-within-isolation. The party-goers each voice boilerplate bigotry, from “I love Tiger Woods” faux solidarity, all the way to, “is it true, once you go Black,?” etc, etc. Daniel Kalyuua’s Chris (who isn’t given much to do other than turning the other cheek, while cocking his head) contacts his buddy Rod (Lil Rel Howery) a few times, the latter serving as a plot/comedic device. Rod’s yuk injections about Jeffrey Dahmer’s victims aren’t nearly as “ruthlessly smart” as you’ve been told to believe. In left-wing circles, Te-Nehisi Coates’ “black bodies” rhetoric is prevalent. But even if you weren’t familiar with the phrase, you’d be able to spot the related denouement a half mile down the road. Ultimately, writer/director Jordan Peele, known for delivering laughs as half of Key & Peele, delivers half a splendid horror film here. It’s impossible not to be impressed by the opening charged atmosphere and characterization in his debut, just don’t be THAT impressed. He’s more than set himself up as someone to watch out for though.